VICTORIA - Lucy Campbell says she felt the blast that killed her brother a second time when she heard the news that no criminal charges would result from the Burns Lake sawmill explosion. Maureen Luggi says she’s still in shock that her husband died at work and nobody will be held responsible. 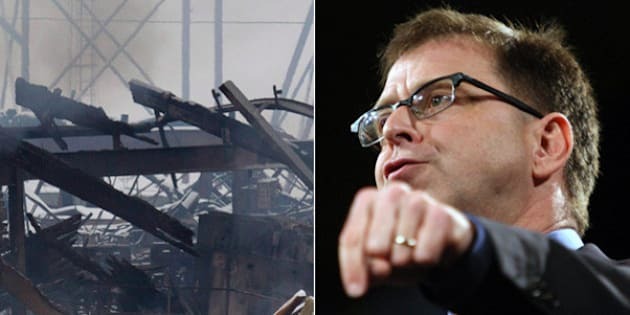 Campbell and Luggi, reacted with dismay Monday to an announcement last week that Crown counsel would not proceed with charges after what it described as a flawed investigation by WorkSafeBC into the sawmill explosion two years ago at Babine Forest Products. Luggi and Campbell supported calls Monday by Opposition New Democrat Leader Adrian Dix for an independent probe into the investigation that Dix said was “bungled” by the Liberal government. Anton noted that any decision on whether to approve charges is the responsibility of the Criminal Justice Branch, a decision made independent of government. ”I have been briefed ... and am confident that Crown Counsel have conducted a thorough and careful review of this matter,” she said. Robert Luggi, Jr., 45, and Carl Charlie, 42, died in the blast that levelled the sawmill. Both men had three children each. Twenty other workers were injured, many seriously. Luggi said her family and the families of the other blast victims and sawmill workers across British Columbia need answers about the cause of the blast and they especially need to know somebody will be held responsible. A Criminal Justice Branch statement Friday said some of the crucial evidence gathered during the WorkSafeBC investigation would not be admissible in court, reducing the likelihood of a conviction. “Based on the evidence that would likely be available for presentation by Crown Counsel in court, the branch has concluded that there is no substantial likelihood of conviction for any of the regulatory offences recommended by WorkSafeBC,” the statement said. No charges will be laid under provincial Workers Compensation or Occupational Health and Safety legislation. An earlier RCMP investigation ruled out criminal charges. The concerns raised by the branch include the failure to obtain search warrants and the failure to inform witnesses of their charter rights before taking statements. Luggi said Premier Christy Clark has the power to help the families heal from the tragedy. Dix said the Crown and WorkSafeBC failed to work together adequately in the investigation, which resulted in the decision not to lay charges. Dix said cabinet ministers Rich Coleman and Shirley Bond and former cabinet minister Pat Bell intervened last year to delay the release of a safety-related report, but the government has said the release of the report was not immediately made public because it may have interfered with the explosion investigation. WorkSafeBC is set to release its final report into the blast this week. The Oregon-based owners of the Burns Lake sawmill issued a statement Friday on the Crown’s decision not to lay charges. “While we are pleased no criminal or regulatory charges will be approved by Crown counsel, we never will forget the terrible tragedy and the resulting effects on our employees, their families and the community of Burns Lake. We have done our best in the aftermath to care for our affected employees and their families and mitigate the impact on the community,” said Steve Zika, CEO of Hampton Affiliates. A few months after the Burns Lake blast, in April 2012, an explosion at the Lakeland Mills in Prince George, B.C., killed employees Alan Little, 43, and 46-year-old Glenn Roche.